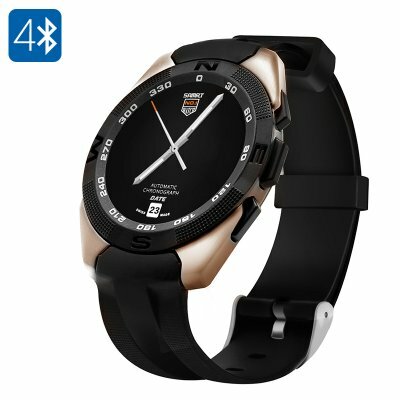 Successfully Added NO.1 G5 Smart Watch - Bluetooth 4.0, Pedometer, Sleep Monitor, Heart Rate Sensor, iOS + Android Smartphone Sync (Gold) to your Shopping Cart. This smart watch with its affordable price is made for the masses but retains a high end premium feel and is pack full of fantastic features to enhance your daily life. Combining the fitness functions of heart rate monitor, sedentary reminder, pedometer and sleep monitor the N0.1 G5 is a sure fire way to help improve your health and let you push your fitness to new highs. Keep motivated on your runs or gym session with some inspirational music as this Bluetooth smart watch can play tunes direct from your Smartphone. Don't worry about missing the latest social updates as you work out as the G5 can sync directly with your Android or iOS smartphone and bring your Twitter, Facebook and WhatsApp notifications direct to your wrist. If you're constantly leaving your phone behind then this smart watch can offer a helping hand as it has an anti lost function that will notify you should your phone and watch move to far apart. Doubling as a remot camera trigger the smart watch can help you snap great photos from your phone without getting that vanishing hand on the side of the screen. This Bluetooth Smart watch comes with a 12 months warranty, brought to you by the leader in electronic devices as well as wholesale smart watches..